Although somewhat late to the on-demand party, 2017-18 Upper Deck Game Dated Moments Hockey is UD's NHL take on the instant gratification collectors have seen from other card companies. The concept is similar to on-demand platforms like Topps Now and Panini Instant. Rebooting the Game Dated Moments insert line of the past, the 2017-18 Upper Deck Game Dated Moments checklist is built weekly with standout moments from the ice. Sold for one week, each card includes in-game photography from the event or achievement in question, as well as the date and a description of the moment. Of course, there is also a UD hologram on the back. 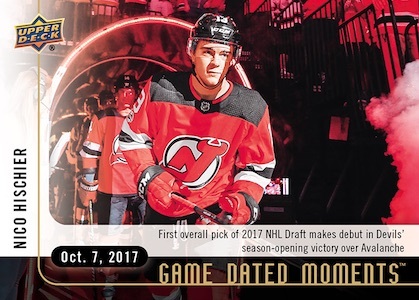 2017 NHL Draft Pick Achievement card – Complete "1st Period" set (All Game Dated Moments cards from 10/04/2017 to 02/02/2018) and receive: #A1 Nico Hischier - Becomes the First Swiss Born Player to be Taken No. 1 Overall in the NHL Draft. According to Upper Deck, new cards will be made available every Friday (at 9 AM PST) through Upper Deck ePack. 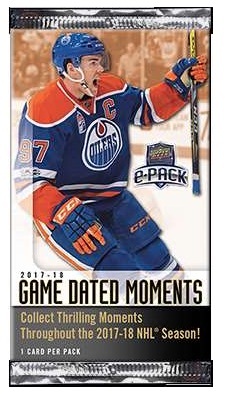 Each Game Dated Moments pack can be purchased provided that you also buy a different ePack hockey product in the same transaction. You can specify the exact card you want from that week's selection. The one-card packs run $3.99 and the cards are added to your ePack collection digitally at first. While the cards are tied into the ePack program, the digital cards can be redeemed as physical cards from Check Out My Cards (COMC) within approximately 3-4 weeks from the end of the selling period. Collectors can add their suggestions for the weekly 2017-18 Upper Deck Game Dated Moments cards by using #PickTheMoment and tagging @UpperDeckHockey on Twitter. The list will be updated throughout the season.